As predicted earlier, the buzzword “du jour” in tourism is fast becoming transformation. Its predecessor, sustainability, has through over and mis-use become meaningless and ineffective lacking the capacity to lift hearts, inspire hope and, ironically, sustain action. I am delighted but also very concerned.. Here’s why. New buzzwords are favoured by a sector that, by its very nature, has to focus on quick fixes to short-term problems and thrives on novelty. Tourism is a phenomenon run by marketers and there is a good reason for that. Its suppliers sell dreams and fulfill fantasies. The customer cannot experience the “product” prior to its consumption. Hosts must defy gravity and inertia to lift their customers from their armchairs to a place far from home by stimulating desire and imagination. Hosts must paint pictures that trigger a desire strong enough to generate a “click,” then a booking and sustain interest and enthusiasm through the rigours and unpleasantries of passage to the source of the anticipated experience. In my forty-four year career, I have observed first-hand how marketers have progressed from one promise to another as their customers became more sophisticated in their needs and demands. While I like to look forward, sometimes an understanding of context and history can be helpful. 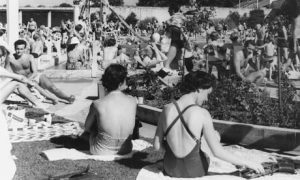 After two decimating world wars, the primary travel motivation was simply “rest and relaxation” stemming from a human desire to escape from the drudgery of working life on assembly lines and the ugliness of industrial cities. We clambered on board smoky steam trains for a crowded journey to a coast, took off some of our clothes (as few as possible) and frolicked on pebbly shores in freezing water surrounded by hoards of the very same people we wished to escape. The arrival of the jet plane simply met that need to escape with ever more exotic, comfortable and appealing destinations further from home where the sun shone every day, people spoke funny and ate weird food. 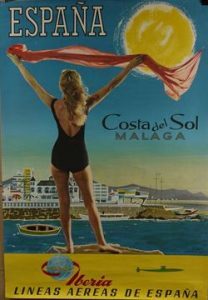 In the UK, coastal towns like Blackpool and holiday camps were passed over for the delights of all-inclusive resorts in the Costa Del Sol etc. No sooner had air routes and landing spots been negotiated than the developers moved in. Orange groves were transformed into hotel complexes, shopping malls and amusement arcades. Leo Hickman brave author of The Last Call describes this migration well. From the 1960s onwards, mainstream travel developed its industrial model into a science through vertical integration and development of an increasingly efficient value chain. Volumes exploded, supply expanded, transaction costs declined, competition got very fierce, labour turnover soared and pricing and product attributes were used as the primary point of differentiation. During the same period, tourists steadily accustomed to new pleasures became more discerning – more interested in experiences that product attributes and seeking ever more authentic, immersive experiences as time passed. In 1993, twenty-two years after Rachel Carson’s Silent Spring gave a boost to a fledgling environmental movement, Mexican architect Hector Ceballos-Lascurin coined the term “eco-tourism” and, thereby, provided a fresh way for suppliers to differentiate their “products” and appeal to the new generation of nature enthusiasts. Tourism had a discovered a new purpose and rationale for existence – conservation. For a while it seemed that any resort that encouraged its visitors to walk outside its gates into the “wilderness,” visit a park or wildlife sanctuary, rescue a turtle or track a leopard’s footprint, could use the pre-fix “eco”. 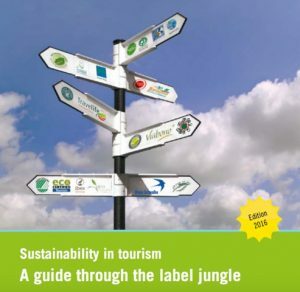 The very term “green washing” defined as the use of PR to deflect or misrepresent practices designed to minimize environmental damage, originated from the tourism industry. It was coined by an American alarmed by the notice on the bathroom counter while staying in a Samoan hotel in the mid 1980s. Over the following 35 years, the terms responsible and sustainable gradually replaced “eco” when certain standards were met. Certification and sustainable education became new growth industries such that so many certification programs proliferated a new body was necessary to integrate and certify the certifiers. Note: this is NOT to decry or diminish the value created by hundreds of legitimate users of the term “eco” or the importance of deploying sustainable practices but simply to suggest that overuse and misuse have undermined efforts of the sincere and authentic while only slowing tourism’s race towards the brink. By 2017 there likely isn’t a smart destination or intelligent host left on the planet that doesn’t state the need to act sustainably. The message infuses media even if behavior lags. Each year thousand of graduates with the term sustainable tourism in their resumes earnestly enter the workforce in order to make the world a better place through tourism. The fact that many of these well-intentioned undergraduates are either under-employed, unemployed or consultants seeking work suggest there’s a gap between host aspiration and willingness to pay. In the meantime, tourism has proven its resilience and bounced back from a temporary lull in demand associated with the global financial crisis of 2008 stronger and as ambitious. Propelled by a rising and global middle class, globalisation, technology and its perceived value as a vital stepping-stone towards economic progress, the growth and associated environmental footprint of tourism are greater than ever before. There’s no evidence that tourism has decoupled its appetite for and dependence on growth from its need to consume precious resources and generate expanding mountains of waste, or emissions of carbon and other air pollutants. The Writing on the Wall – warning or prediction? 2016 could be described as the year the writing literally appeared on the wall – intimating, of course, that we might be headed towards one at an uncomfortable pace. As international tourism continued its vertical climb further up the hockey stick graph of exponential growth, signs of a backlash grew in in frequency and intensity. Nature couldn’t speak but residents and even some visitors could. Congestion, displacement, price inflation, pollution, deteriorating infrastructure and lack of basic supplies for residents were the initial causes of discontent. Incidences of resident backlash increased to the point that the topic became worthy of filmmakers’ attention. Peggy Vail’s film Gringo Trails paved the way, followed by Nana Rebhan’s Welcome Goodbye set in Berlin, and Eduardo Chibás’ Bye Bye Barcelona. Elisabeth Becker’s book Overbooked (2013) picked up the story started by Leo Hickman in The Last Call (2007) and all followed – likely without knowing – in the footsteps of Mishan and Krippendorf authors respectively of Tourism Blessing or Blight (1971) and The Holiday Makers (1984), two authors who are likely turning in their graves with frustration. 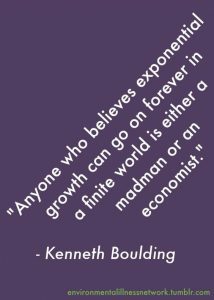 These wise men didn’t have a buzzword or social media to attract scores of followers but they knew in their bones the wisdom of economist Boulding’s pronouncement (see image). 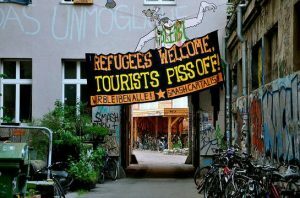 For as long as the negative side effects of the tourism wave were felt far from the boardrooms of companies in the source countries, attention was sporadic and muted and institutional resistance prevailed. But once experienced rapidly and intensely by countries new to inbound tourism growth yet sporting established, sophisticated and seemingly robust infrastructures and governance systems as in Iceland, Spain, and, most recently, New Zealand, everything changed. In 2016, Skift’s article on Iceland and the introduction of yet another buzzword or hashtag, – “over tourism” generated another milestone in tourism’s brief history – see Changing Tourism from the Inside Out. The mainstream press sniffed a trend and source of future stories complete with problems, fear and an identifiable source of blame and gave tourism the attention it has always craved – it just wasn’t positive. This put the WTTC on the back foot and, unprecedentedly, the self-acclaimed authority on tourism publicly admitted a “re-think” might be necessary. Success was beginning to hurt. Meanwhile, out in the real world of humans going about their lives as workers, consumers, and community residents, a deeper more momentous change was afoot. Two markets in particular- Millennials and Boomers – that happen, in combination, to account for 80% of the consumer marketplace, were flexing their purchasing muscles and demonstrating that a much deeper value shift was taking place. Many among the affluent, educated beneficiaries of the global economy had met their “deficiency needs” and the quest was now on for meaning and purpose – a quest that could change everything as discussed in detail in a 2012 paper Can Tourism Change its Operating Model: The Inevitability and Certainty. At the same time, marketers (simply human beings experiencing the same shift in their lives and psyches) are learning to deploy the rich insights of neuroscience and positive behavioural psychology to appeal to deeper motivations. Travellers are no longer just trying to escape drudgery (escape), renew relationships (romance), or even develop their self esteem by mastering a new skill, pushing through fear, or finding a new way simply to brag, they are beginning to “wake up” – discern the prison walls of their own limited perception. All too aware of the overwhelming levels of life’s complexity and fragility, and having to cope with a volatile, uncertain, complex, and ambiguous world replete with wicked problems, many know in their hearts that business as usual is untenable i.e. utterly unsustainable. Tinkering with an existing system won’t work but fear of the unknown (what do we replace the old system with and how? ) and fear of the potential dislocation that occurs when old systems die can cause resistance and paralysis. Nevertheless, at a personal level, once the question for meaning and both personal and shared purpose has begun, there’s usually no going back. In keeping with the unattributable maxim, “Never let a good crisis go waste” a hoard of coaches, consultants, psychologists, are rushing to meet the exploding demand for support and guidance as individuals embark on their own Hero’s Journey to pass from spiritual-psychological adolescence towards maturity. Recently, a few brave travel suppliers, as described by the Transformational Travel Collaborative, and exemplified in social enterprises such as Authenticitys; Claudia Roth’s work – Soul Luxury; and supplier Andy Metcalfe’s tour company in Peru, Outer Travels Inner Journeys (to name only three of countless many), are demonstrating how travel can play its part in helping guests achieve their inner quest for meaning and purpose. So why am I both delighted and concerned about the arrival of “transformation” in tourism’s rich lexicon of aspirational adjectives? Delighted because, by serving the higher motivations of guests (latent or fully realised) I believe travel can fulfill its own higher purpose – restoring a right relationship between humanity and nature. I have explored the issue of purpose in previous posts and Purpose forms the focus of a key chapter in this resource material prepared for tourism educators: Social Entrepreneurship in Tourism: The Conscious Travel Approach downloadable here. Concerned, because I can “see,” as in anticipate, the damage that will be caused if this becomes the latest hot buzzword used to sell yet another tour by persons unfamiliar with its meaning or the implications of using it as a promise. Psycho-spiritual transformation – the kind being sought by the latest breed of discerning travellers – cannot be delivered or promised by the host. It is what’s called an emergent property – the result of the inter-relationship between the guest, host and the conditions they experience. For example, confine a person to solitary confinement for several months and he or she will likely come out transformed – some will suffer post-traumatic stress for life, while others might experience a form of spiritual liberation and turn into inspirational teachers. Neither outcome can be designed nor predicted. I would hate to see the word transformation so over and misused that it loses the potency we need at this juncture in history. Because I also am convincedwe are standing on an evolutionary brink – humanity is being called to evolve, to undergo a phase change in our state of being from that of battling with Mother Nature to becoming a consciously creative partner with her. Transformation will occur when we as a species “wake up,” “grow up,” and “step up.” It involves all the same processes as becoming conscious – but I would hate to see conscious become just another marketing buzzword either!! Yes, tourism is in need of transformation too. That necessitates a transformation in the way hosts see, are and act and that doesn’t happen by dictate, decree or wishful thinking. We must let go of an extractive model that, as it grows beyond a certain point, becomes destructive. We must find ways of delivering greater benefit at less social, environmental and financial cost.. That isn’t going to be easy and won’t happen simply by exploiting yet another market opportunity and utilizing another cool marketing bi-line. It will happen when hosts start their own inner journey of awakening both individually and together and co-create a set of practices based a very different understanding of what it means to be human and our role in the evolution of Life.. The journey will involves some fearless questioning (see Why? The most important query of our time), an exploration into root causes and a complete re-design based on a very different set of beliefs, assumptions and values. And that infinitely more demanding and rewarding process cannot start a moment too soon. Anna Pollock is a strategist and thought leader in tourism who has been thinking and writing about how tourism might be transformed for over a decade. Anna may be quiet for a while as she completes a book for general consumption, currently titled Re-designing Tourism from the Inside out and Downside Up. To help fund that process, she is available to speak to communities of hosts (suppliers and residents of a destination) about a better future. If you interested in learning more, and getting a sneak preview(! ), please email anna@conscious.travel. Seminal, thanks for the long perspective and deep thinking on this opportunity before us to make it right! Well done as always Anna. I too worry about the nomenclature and references to so many kinds of tourism but I’ve always worried about the word “transformational”. I have to think that the more sophisticated humans that would take these kinds of trips are sufficiently “baked” in their outlooks and worldly views. Is it asking too much of a two week trip to sufficiently change someone so much that it actually tranforms them? I’ve got friends who have done voluntourism in lesser developed countries that have reported amazing experiences and come home engaged but in reality they do go back to their regular lives, perhaps just a bit more interesting at a cocktail party. I’m open to thoughts on this,but might suggest that they may be “enlightened” and “educated” but transformed–really? That’s a pretty big word and one that I would suggest the tourism industry throw around carelessly. Thanks for starting this important conversation.